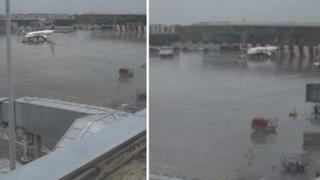 A Ryanair plane with 177 people onboard was damaged when it was reversed into an airport barrier, a report has found. It was being moved by a tug into a parking area at Stansted Airport on 30 April last year to wait for its take-off slot. Accident investigators said bad weather reduced visibility for ground crew, who failed to stop the aircraft before part of its tail hit a blast fence. The plane needed to be repaired but no-one was injured. A report by the Air Accidents Investigation Branch said a cabin crew member called the flight deck to say she thought the back of the plane had hit something as it was being pushed back from the gate. 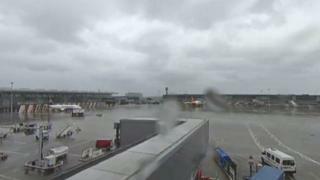 Engineers were called and found part of the tail had struck a blast fence, a safety device that redirects the powerful blast of jet engines at airports. Damage was found to one of the elevators, which are used to control an aircraft’s descent and rise. The tug driver said heavy rain and standing water made ground markings difficult to see. The report also found the headset operator, who was standing on the tarmac and communicated with the flight deck and the tug driver, was still in his training period and had been working alone. There were 170 passengers and seven crew onboard at the time, but none were injured and all were able to leave the plane using the steps as normal. 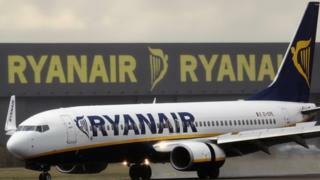 Ryanair operates about 400 flights a day from London Stansted Airport, in Essex, which is its UK base.